Download "Management Services Board (Repeal) [No. 5 of 2011 67"
1 Management Services Board (Repeal) [No. 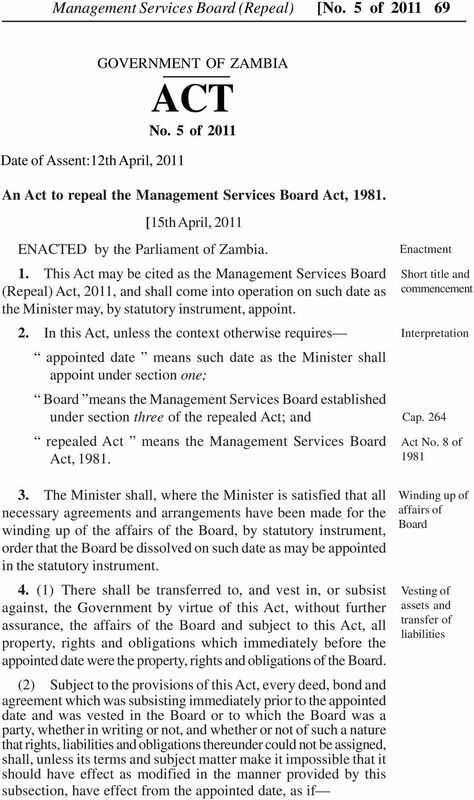 5 of THE MANAGEMENT SERVICES BOARD (REPEAL) ACT, 2011 ARRANGEMENT OF SECTIONS Section 1. Short title and commencement 2. Interpretation 3. Winding up affairs of Board 4. 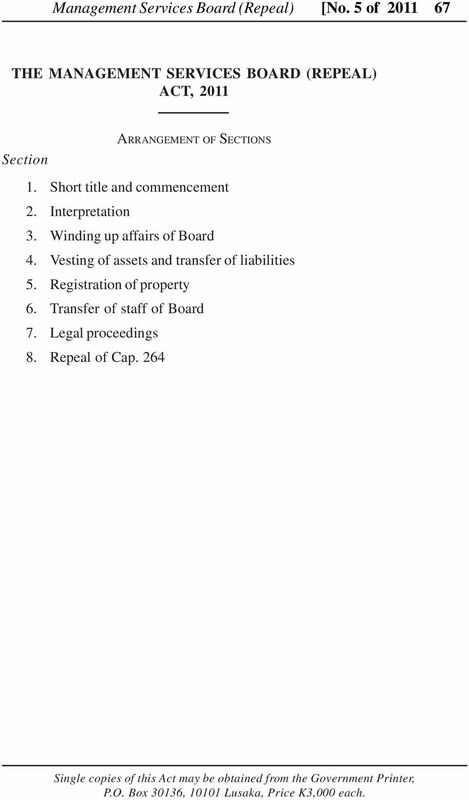 Vesting of assets and transfer of liabilities 5. Registration of property 6. Transfer of staff of Board 7. Legal proceedings 8. Repeal of Cap. 264 Single copies of this Act may be obtained from the Government Printer, P.O. Box 30136, Lusaka, Price K3,000 each. 4 70 No. 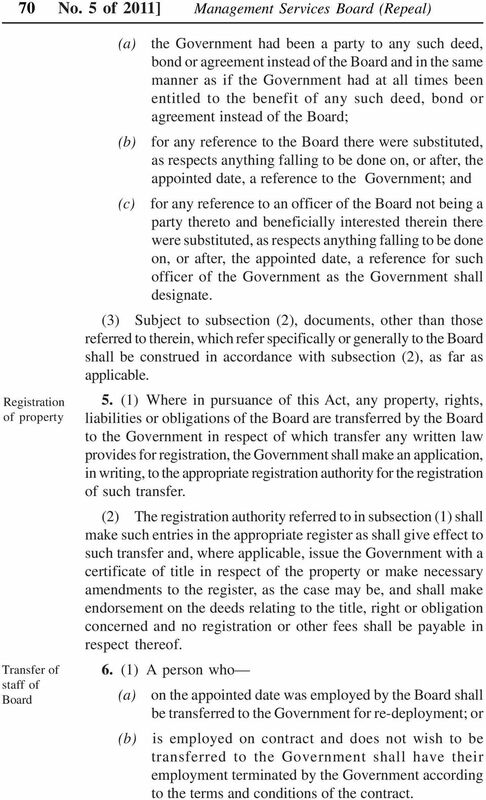 5 of 2011] Management Services Board (Repeal) Registration of property Transfer of staff of Board (a) (b) the Government had been a party to any such deed, bond or agreement instead of the Board and in the same manner as if the Government had at all times been entitled to the benefit of any such deed, bond or agreement instead of the Board; for any reference to the Board there were substituted, as respects anything falling to be done on, or after, the appointed date, a reference to the Government; and (c) for any reference to an officer of the Board not being a party thereto and beneficially interested therein there were substituted, as respects anything falling to be done on, or after, the appointed date, a reference for such officer of the Government as the Government shall designate. (3) Subject to subsection (2), documents, other than those referred to therein, which refer specifically or generally to the Board shall be construed in accordance with subsection (2), as far as applicable. 5. (1) Where in pursuance of this Act, any property, rights, liabilities or obligations of the Board are transferred by the Board to the Government in respect of which transfer any written law provides for registration, the Government shall make an application, in writing, to the appropriate registration authority for the registration of such transfer. (2) The registration authority referred to in subsection (1) shall make such entries in the appropriate register as shall give effect to such transfer and, where applicable, issue the Government with a certificate of title in respect of the property or make necessary amendments to the register, as the case may be, and shall make endorsement on the deeds relating to the title, right or obligation concerned and no registration or other fees shall be payable in respect thereof. 6. 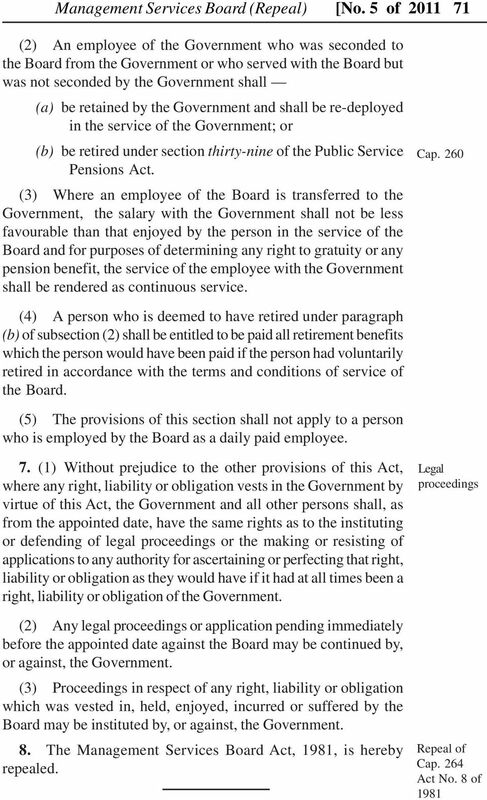 (1) A person who (a) (b) on the appointed date was employed by the Board shall be transferred to the Government for re-deployment; or is employed on contract and does not wish to be transferred to the Government shall have their employment terminated by the Government according to the terms and conditions of the contract. The Life Insurance Corporation Act, 1956 ------------------------------------------------------------------------ (Act no. LOANS ACT. Section 2-Authenticating of Agreements, Securities, Etc. Section 3-Authority to raise External Loans. EXTRAORDINARY 2203 GOVERNMENT OF FIJI GAZETTE PUBLISHED BY AUTHORITY OF THE FIJI GOVERNMENT Vol. 14 FRIDAY, 10th May 2013 No. 48  GOVERNMENT OF FIJI INCOME TAX (AMENDMENT) DECREE 2013 (DECREE NO. Number 35 of 2007 PERSONAL INJURIES ASSESSMENT BOARD (AMENDMENT) ACT 2007 ARRANGEMENT OF SECTIONS Section 1. Provisions in relation to costs in certain proceedings. 2. Short title and collective citation. Landlord and Tenant Act 1954 PART I SECURITY OF TENURE FOR RESIDENTIAL TENANTS Provisions as to possession on termination of a long tenancy Compensation for possession obtained by misrepresentation 14A. Chapter: 32 COMPANIES ORDINANCE Gazette Number Version Date. Long title 30/06/1997. To consolidate and amend the law relating to companies.